With a stay at Atlantic City Apart Service in Salvador (Ondina), you'll be a 5-minute drive from Hill of Christ and 5 minutes from Farol da Barra Beach. Featured amenities include complimentary newspapers in the lobby, dry cleaning/laundry services, and a 24-hour front desk. A shuttle from the airport to the hotel is provided for a surcharge (available 24 hours), and free self parking is available onsite. With a stay at this apartment in Rio de Janeiro (Laranjeiras), you'll be within a 15-minute drive of Sugar Loaf Mountain and Catedral de Sao Sebastiao do Rio de Janeiro. 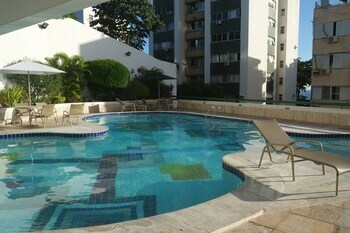 With a stay at this apartment in Rio de Janeiro (Copacabana), you'll be minutes from Edmundo Bittencourt Square and close to Christ the Redeemer. Free self parking is available onsite.